Learning and growth happen at camp in many different ways. 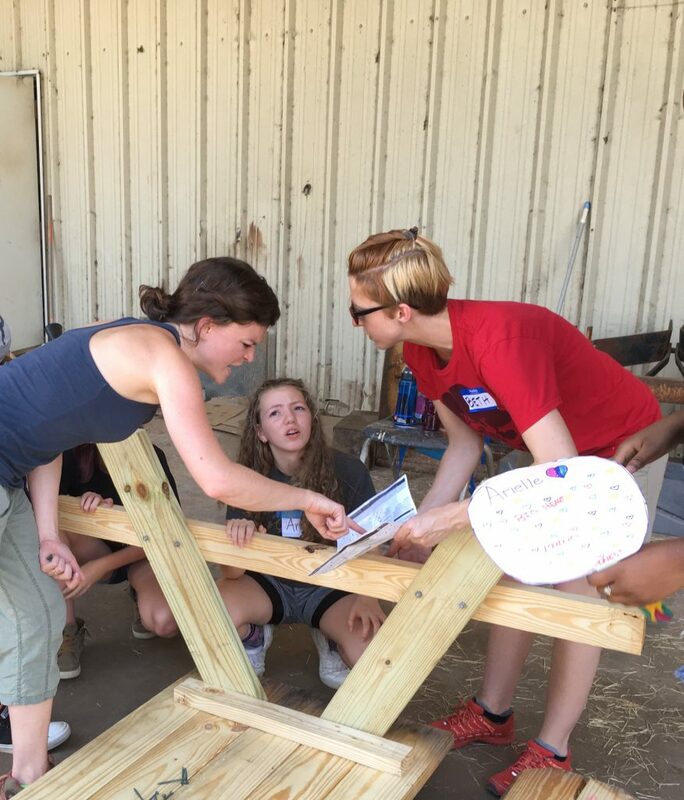 Sometimes learning happens because of the carefully planned curriculum, sometimes because of the ideas and experiences that campers spontaneously share with each other, and sometimes because of the serendipity that brings eager learners and inspiring teachers together in an environment that fosters exploration and knowledge-sharing. Serendipity certainly abounded on Tuesday! Our morning facilitator, Beth Dierschow, after leading a great program on the right we all have to appropriate education, stayed on for the afternoon to help with our building project. 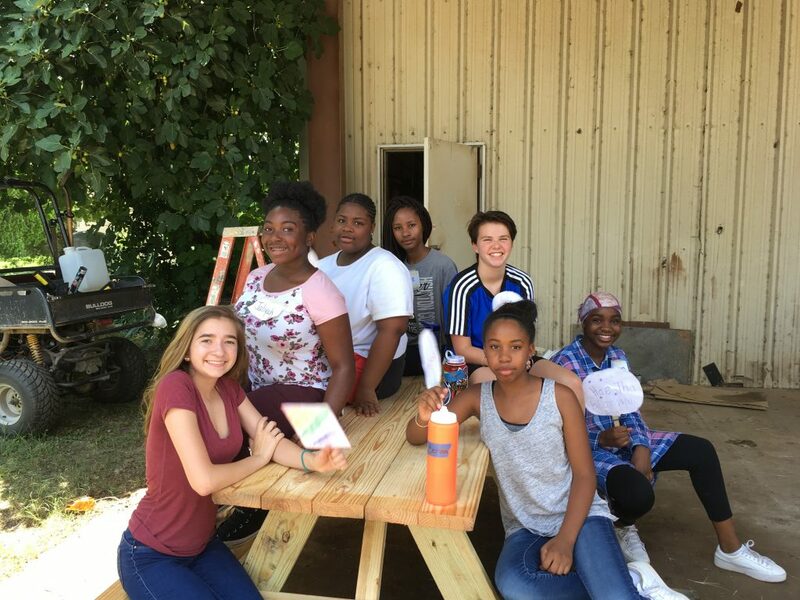 Campers were building two picnic tables and playground equipment for Casa Alterna‘s afterschool program in LaGrange, Georgia. Guests from Casa Alterna included Keyal Loveland and her husband Josh, along with Casa Alterna founder Anton Flores and three young friends. 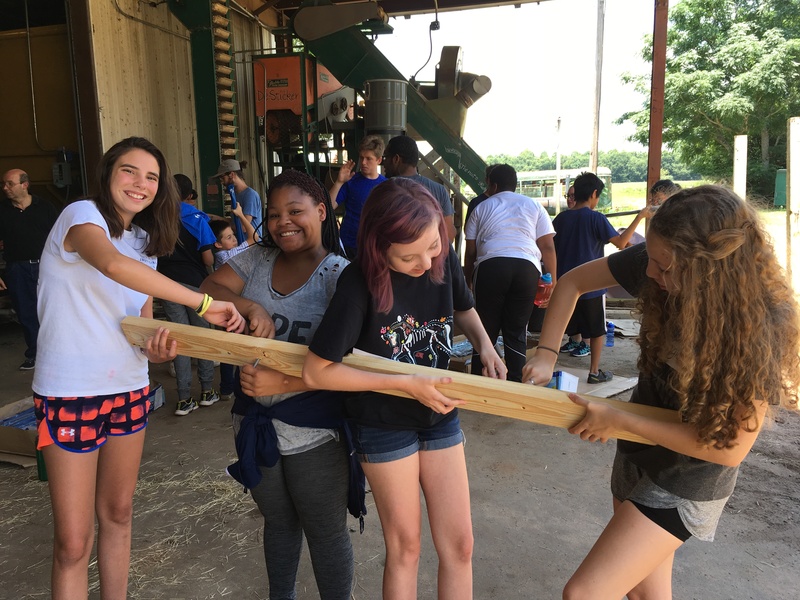 Groups of campers tackled different parts of the job. Beth and Keyal gravitated toward two groups of girls who found themselves with piles of picnic table parts, and before long it was clear how much girl power was at work. 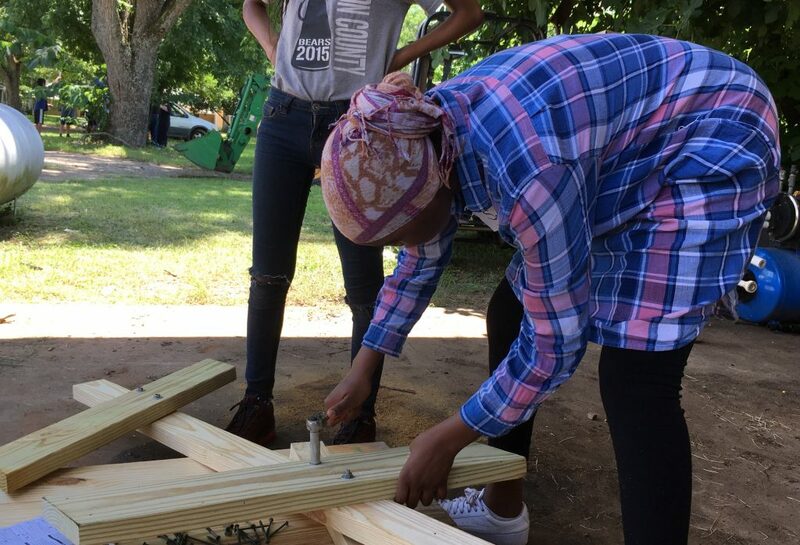 Directions were deciphered, boards were positioned, screws were put in place, bolts were racheted in, power tools were utilized, surfaces were sanded, uncertainties were overcome, and successful completion of two sturdy tables was celebrated. 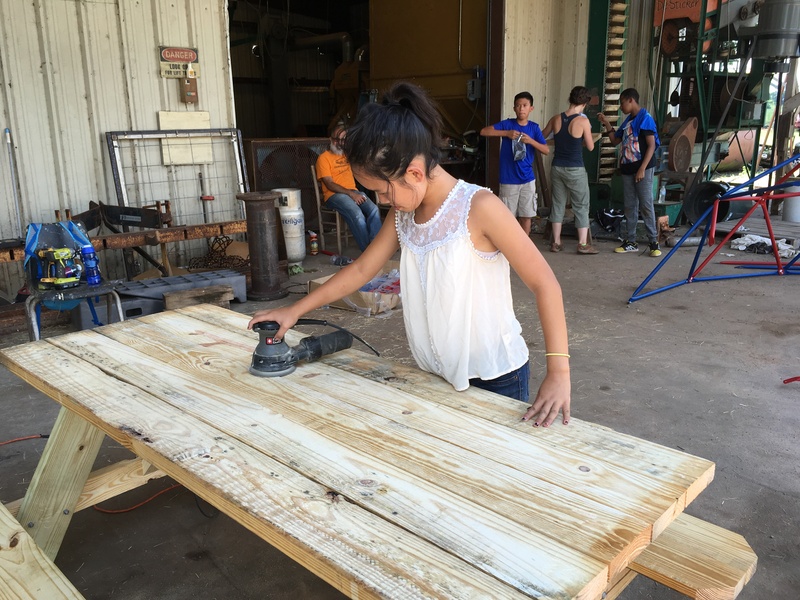 “I feel so powerful!” one of the campers exclaimed when mastering the use of a new tool. This project, on right to education day, was supposed to be about supporting a meaningful afterschool program that serves immigrant kids. But seeing these girls working together with a collaborative spirit, learning from Beth, Keyal, and counselors Lily and Carla, it became clear that much more was going on: young teens were learning from strong women about their own competencies, and recognizing how empowering it can be to step out of their comfort zones and try out new skills. Emalie, Jaliyah, Mia, Divine, Josie, Seham, and Arica bask in pride over a job well done!